Dr. Peter Uhlmann, Master Wang's most senior student, has written a book (see below) and several articles about tai chi and Master Wang. Three of the articles are featured here. In this article Dr. Uhlmann makes the important point that in tai chi the ability to sense and receive an opponents energy is of primary importance. A connection must be made to the partner and to the ground before one can attempt to use internal issuing power. It is in the harmony of receiving and giving that a true connection can be found. 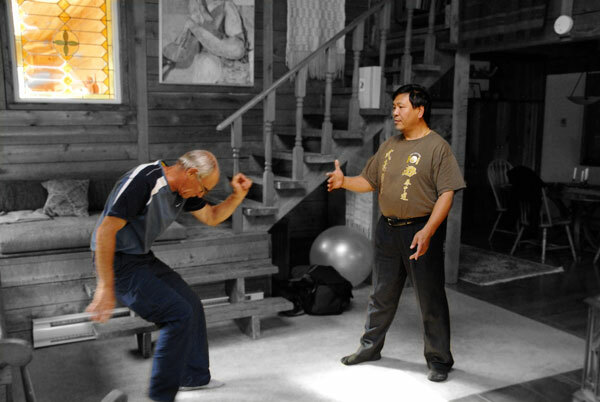 Here Dr. Uhlmann provides a detailed look at Master Wang's philosophy and practice. Written for the British Columbia Medical Journal, this article outlines a brief history of tai chi and describes some of the research into the health promoting benefits of tai chi. In this updated article, James Milne, one of Master Wang's senior students, writes about Tai Chi and how Master Wang's unique philosopy is expressed through the Tai Chi form and Search Center. James Milne writes about Master Wang's roots and philosophy. He explains the concept of matching and how it exemplifies the practice of Search Centre. Joe Zanbilowicz, a senior student of Master Wang, shares some reflections with fellow students on how, in doing search center, one contends with weight shift when the extension of energy is required. Flowing the Tai Chi Way chronicles the unfolding relationship between Master Wang and Peter Uhlmann. Initially, Peter is only interested in learning the classic movements. However, he is is soon captivated by Master Wang's martial abilities and intimate knowledge of chi. Peter begins a life of study, learning to incorporate chi energy and spirit into his physical activities, utilizing Master Wang's seven principles of tai chi. In his friendship with Master Wang, Peter learns more than the tai chi form. He realizes that tai chi can guide him in daily routines and relationships. He learns about Chinese culture and traditions and the unique and sometimes difficult master-student relationship. Eventually he becomes Master Wang's senior student, and a strong bond develops between them. Master Wang, is now residing in Comox, British Columbia, Canada. He is an international champion in tai chi and has been teaching for twenty years. He has brought innovative ideas to traditional tai chi and these have culminated in his seven principles which apply to all forms of tai chi and other martial arts. He has also discarded the concepts of push hands and created search center which relies on internal power rather than external muscular force. He is available to students from novices to teachers who wish to take his classes or attend his workshops. As his senior student, Dr. Uhlmann has published several articles about Master Wang and tai chi.